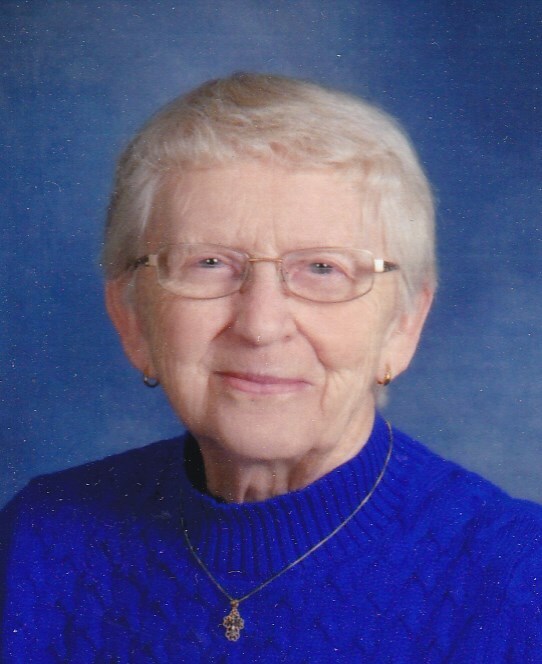 Phyllis L. Erdman, 88, of Eau Claire, formerly of Augusta, passed away Monday morning, March 18, 2019 at Mayo Clinic Health System – Eau Claire, with her loving family by her side. Phyllis Lorraine Erdman, daughter of Edward and Lorena (Moldenhauer) Kuehn was born Nov. 11, 1930. She was raised in rural Fall Creek, where she was baptized and confirmed at St. John’s Lutheran Church, attended country school and graduated from FallCreek High School in 1947. Phyllis was united in marriage to Warren Erdman on Oct. 9, 1949 at St. John’s Lutheran Church. The couple farmed in Bridge Creek Township just south of Augusta until retiring and moving to Eau Claire in 1988. After Warren passed away on November 18, 2010, Phyllis continued to live in their home until moving into Heritage Assisted Living in Eau Claire in the springof 2016. Phyllis worked along side her husband on the farm in addition to raising her 3 children and taking care of her home. She was an excellent baker and relaxed by reading and working puzzles. After the couple retired they were fortunate to be able to travel. They exceeded in visiting nearly all of the 50 states, including Alaska and Hawaii. They also traveled to Germany, Switzerland, Newfoundland and Nova Scotia. Phyllis will be dearly missed by her son, Roger (Tammy) Erdman of Necedah; 2 daughters, Judy (Fritz) Black of LaCrosse, Carol (Mark) Brevik of Augusta; 5 grandchildren, Jennifer (Paul) Birulkin, Matthew (Melissa) Erdman, Nicholas (Melissa) Brevik, Aaron (Janet) Black, Amanda (Kevin) Wagner; 7 great grandchildren, Ryanand Kiera Brevik, Finnley Wagner, Alizybeth and Bentley Black, Lola Erdman, Sidney Birulkin; step grandson, Justin (Nora) Brooks; 5 step great grandchildren, Chayston, Taiden and Kinsley Brooks, Daniel and Anna Brown; brother, Milton (Delores) Kuehn of Fall Creek; sister-in-law, Bertha Kuehn of Casa Grande, AZ. In addition to her husband, Phyllis was also preceded in death by her parents and brother Warren Kuehn. A visitation will be held Friday from 5 to 7 p.m. at Anderson Funeral Home in Augusta, and Saturday from 10 a.m. to 11 a.m. at Grace Lutheran Church in Augusta. Funeral services will be held Saturday at 11:00 a.m. at the church with burial in the West Lawn Cemetery in Augusta. Memorials can be given in memory of Phyllis to Grace Lutheran Church in Augusta. Phyllis’s confirmation verse. KJV The LORD is my light and my salvation; whom shall I fear? the LORD is the strength of my life; of whom shall I be afraid?